Photo credit: Planet Labs, Inc.
Newly-released satellite images reveal that North Korea’s rogue leader Kim Jong-un caused multiple landslides in his own country with his hydrogen bomb test over the weekend. The landslides were triggered in the detonation area at Pungye-ri’s military base and beyond, with previously green mountains reduced to muddy hillsides. There was also a speculation that the rock over the site had caved in, initially spreading fears radioactive material had leaked into the atmosphere. There were earlier warnings that Kim Jong-un’s continuous meddling with weapons could bring an entire mountain down including Mount Paektu, which is regarded as obe of the world’s most potentially dangerous volcanoes. Seoul later confirmed, however, that the radiation levels were normal. The world condemned anew the latest act of Pyongyang which the isolated state said test was of a hydrogen bomb that could be fitted into a missile. The most recent test further escalated tensions over North Korea’s weapons ambitions. 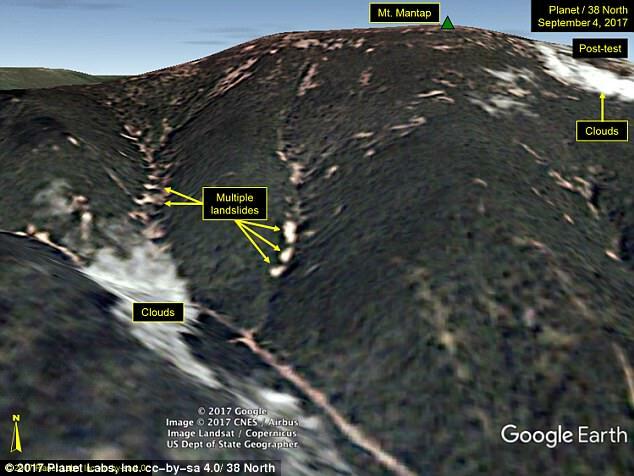 The 38th North website, linked to John Hopkins University in the U.S., published on Monday satellite images showing changes in the surface at the Pungye-ri test site where the ground had been lifted into the air by the tremors, and small landslides being directed into stream beds. The defense minister of South Korea pegged the yield from the explosion at 50 kilotons, while 38 North said it was currently estimated to be 100 kilotons or more. Japan for its part put it at 120 kilotons, which is eight times that of the U.S. device that destroyed Hiroshima in 1945.